Boxcutters, Jigger, Shaker Classic/Boston, Citrus Juicer, Strainer, Highball Glass. Begin by pouring all ingredients except the Soda into a Shaker. Add ice and shake until your hands feel much too cold. Pour into a Highball Glass over ice. 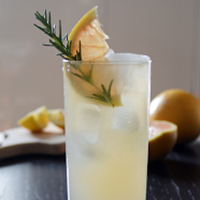 Top with Soda and garnish with a Grapefruit wedge and a sprig of Rosemary.